Social Worker Alison Taylor has protected children for years, putting perpetrators behind bars. Her over-protective brothers, both in law enforcement spend much of their time making sure Alison is safe and happy, including her dating life. Brother Cole hooks her up with a new co-worker Mitch under the guise of her helping him in a sticky situation. Who would have known that they would hit it off right away? And little did Mitch know he would be pulled into a case involving a stalker scaring Alison. Threatening notes, dead flowers and bingo cards begin haunting Alison as her brothers and Mitch try to find out who is behind it. For once she doesn’t mind all their protection. Suspenseful and page turning I read the book in one evening, not being able to put it down! I was concerned that it was in a series and I hadn’t read the first one. 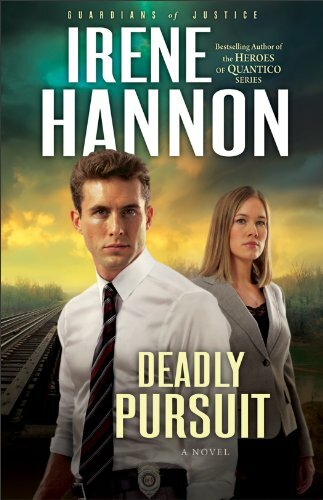 Deadly Pursuit totally stood alone and it was not an issue at all to not have read the first one, though now it is on my “To Read” list. Irene Hannon is a new author to me, that I am excited to read more from! !